1. Clean, scale and rinse the fish under cold water. 2. Make 4 slits on each side, each 1 inch long, between the top and stomach area. 4. Grind together garlic, small onions and 1/2 tsp salt to a smooth paste. 5. Add the tomatoes and grind again to a coarse, chunky paste. 6. Heat 1 tblsp of oil in a pan over high flame. 7. Saute the ground paste for a minute or two. 8. Add the chilli paste and 1 tsp of salt. 9. Stir well for a few minutes, till the tomatoes have mashed well and a thick sauce remains. 10. Heat oil for deep fryin over high flame. 11. Gently add the fish and deep fry for 5 to 8 minutes on each side till golden and crisp. 13. Spread the sauce all over the fish. 15. Garnish with lime wedges and cucumber. 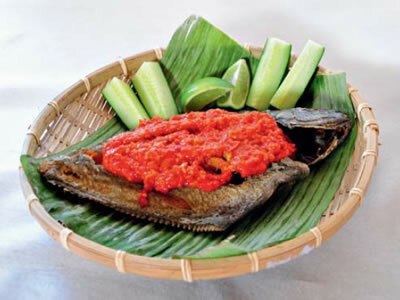 Feel free to comment or share your thoughts on this Crispy Fish with Chili Sauce Recipe from Awesome Cuisine.